It was a great day for AMH New Horizons in Ferm anagh when Michelle Gildernew, MLA and Chair of the Health Committee, popped in to visit. It was a relaxed and informal visit, and Michelle interacted very positively with clients. It’s been a number of years since she last visited the service, and she clearly welcomed the opportunity to catch up with the changes in the service. 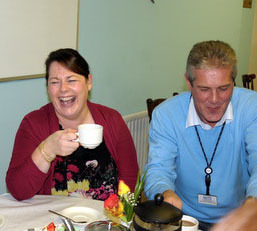 She also had time for a cup of tea and had a go at laughing yoga! Michelle Gildernew has a go at laughing yoga! Michelle certainly left with a good feel for the challenges facing the organisation, and the value of the service provided.